FreeBeachfront Resort In the heart of the hotel zone and only 15 minutes away from the downtown area and 20 minutes from Cancun's International Airport. Raising the Bar in Luxury All-Inclusive, this resort features FREE Golf Green Fees, Cancun`s Only Swim-Up Suites, Pre-Loaded iPods and in-room Bose Stereo Systems! Hyatt Zilara Cancun provides unparalleled vacation indulgence. Hyatt Resorts, with its rich legacy of personalized service and hospitality, proudly presents Hyatt Zilara Cancun, the latest addition to its Hyatt brand of luxury resort hotels with the ONLY oceanview spa in Cancun. This new flagship property, conveniently located in the heart of Cancun`s Hotel Zone, is an Adults-Only, all-suite, all-inclusive resort, combining outstanding facilities with exceptional amenities, where Guests will experience a truly extraordinary escape. 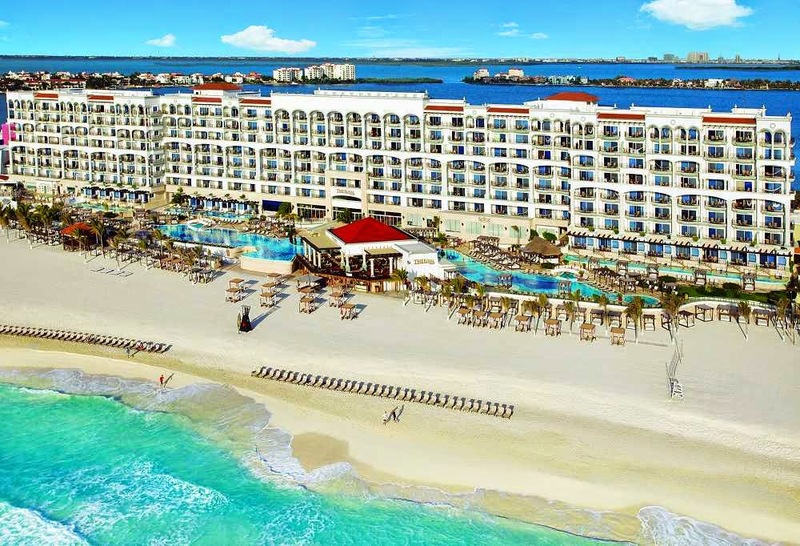 With all 285 suites oceanview, and most actually oceanfront, all Guests of Hyatt Zilara in Cancun are guaranteed magnificent views of Cancun`s turquoise blue waters and a newly expanded, white sand beach. Hyatt Resorts is particularly proud to offer Cancun`s only Beachfront Swim-up Master Suites, the ultimate in romantic accommodations and the perfect honeymoon choice, as are the distinctive Corner Suites, with outstanding views in two directions! Complimentary wireless Internet access in the resort areas and dial-up in Suites; upgraded premium beverages and snacks in the mini-bar, exclusive housekeeping services, an extensive pillow menu and so much more! Selected Suites categories also receive a complimentary one-hour BMW MINI COOPER car rental, an exclusive suite-designated Beach Cabana, a state-of-the-art, Nespresso coffee system and complimentary unlimited domestic and international telephone calls. All suites feature the magnificent new Royal Beds, an in-suite double Jacuzzi, a magic box for discreet 24-hour room service delivery, a multi-position 32-inch Plasma TV and CD/DVD/Radio player, a spacious marble bathroom with oceanview showers and body massage jets and a private terrace or balcony with hammock. While every Guest of Hyatt Zilara Cancun will enjoy superb treatment and outstanding service, over 80% of the suites will also include an enhanced Premium Service. This new service concept will set incomparable standards for the definitive vacation experience for couples, groups, business meetings and special events. Guests will be treated to exceptional facilities including the signature eco-holistic SPAzul ($) offering a full range of traditional and Mayan-inspired massage and body treatments, as well as innovative lifestyle and well-being programs; a modern, state-of-the-art Life Fitness Center with Stott Pilates, spinning, aerobics and yoga. Hyatt Zilara Cancun is proud to offer you an exceptional selection of Restaurants and Bars designed to provide you with a new level of outstanding dining pleasure and to add variety and fun to your overall all-inclusive vacation experience. Tapas and Pintxos:Spanish tapas restaurant, offering a trendy and relaxing gourmet tasting experience from Northern Spain and the Basque region. Open for dinner. Asiana:Contemporary gourmet Asian fusion cuisine with always popular ``Teppanyaki``- spectacular Asian way of show cooking; stylish, romantic setting with cozy seating, glorious sunset views and romantic garden setting ensuring an intimate dining experience. Open for lunch and dinner. Maria Marie: Upscale gourmet Mexican-French fusion cuisine. Mexican hacienda-like dining experience complete with colorful murals painted by Mexican artists, evoking memories of Mexico’s rich heritage. Open for dinner. Chef`s Plate: Gourmet international haute cuisine where a new and different dinner menu is carefully selected each day and artfully prepared at the discretion of the Executive Chef. Open for dinner. Available from RJF category (reservation required). Spice: All day nouvelle ocean view fine dining with sumptuous buffets, show cooking stations and a la carte menu. Casual atmosphere. Open for breakfast, lunch and dinner. Pelicanos:Delicious a la carte gourmet Caribbean fusion seafood in an oceanfront setting by the infinity pool overlooking white powdery beach and turquoise Caribbean. Open for breakfast, lunch and dinner. Trade Winds Swim Up Bar:Snacks and light fare while sunbathing. Openfor breakfast and lunch. Please Note: Minimum age of Guests is 16 years old with a parent and Guests must be 18 years of age to check in.